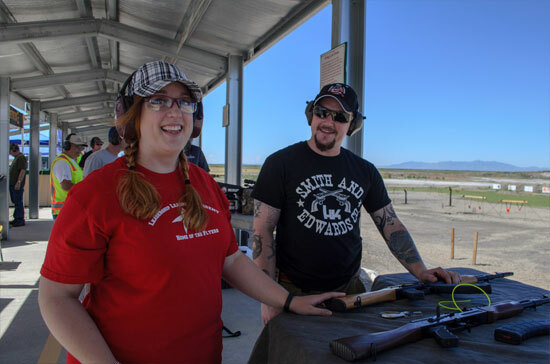 Join us for the 2018 Range Day on Saturday, June 16th! Take your dad out for Father's Day weekend and enjoy some special bonding time together. We'll be at the range from 10 a.m. to 5 p.m. with reps from some of your favorite gun manufacturers. You won't want to miss this fun event. Enter to win this handgun as part of our Range Day festivities. This Springfield XD-S 45 ACP is great for personal safety. Range Day Ammo Punch Passes can be purchased online. Your online purchase will be available for pickup at the event. Or, come into the store and purchase your punch pass in advance. Talk with reps from these great vendors and others in the industry. They'll tell you all you need to know about the latest shooting techniques, newest gun models and best home and personal defense products. Enjoy delicious, island inspired foods from Pauni Island Grill and get cool, refreshing beverages from Island Splash. The trucks will be there and open for business from 10 a.m. to 4 p.m.
Find out about All Smith & Edwards Shooting events... & get a FREE Hunter's Checklist! Karen Cronin, Mayor of Perry City, said the 2015 Range Day was "extremely successful!" "We owe a big thank you to Smith & Edwards and to all the employees that made it happen."